Hope you all had a good Thanksgiving holiday! There’s only a little over twenty days until Christmas and I’m sure you all are getting your gifts and plans in order for the special day. If you are going to knit a gift this year and haven’t decided on what, take a look at my “Holiday Quick Knits” section. 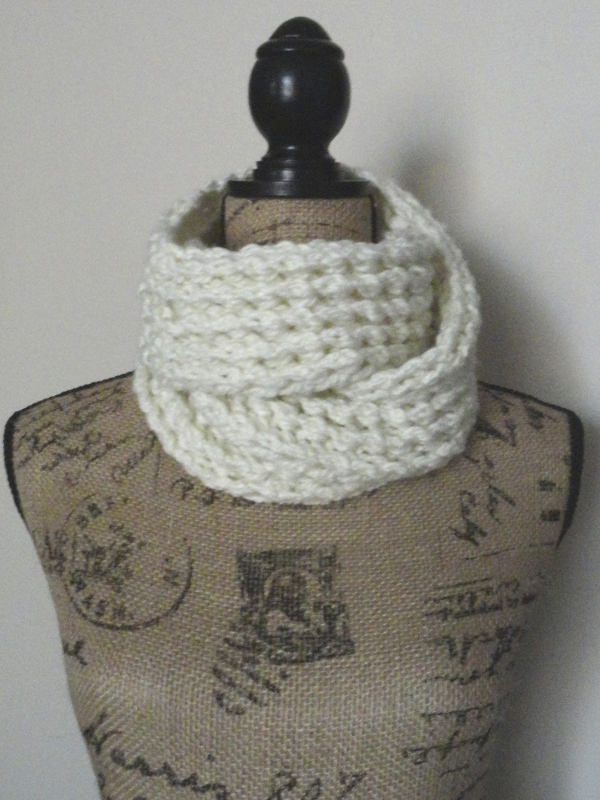 If you still can’t find what you are looking for then my new scarf pattern might do the trick. 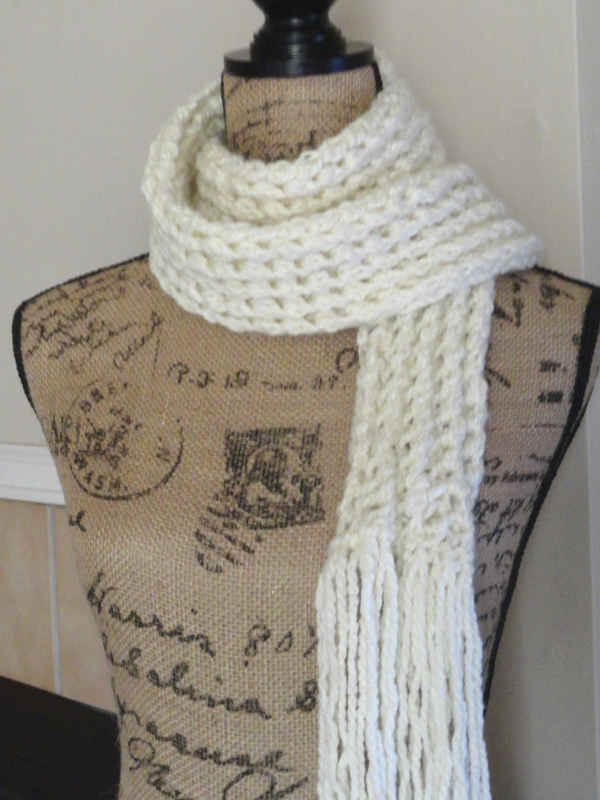 This ribbed lace scarf is the newest addition to my “Quick Knits” series. I have seen many different ribbed lace patterns but I haven’t seen one that produces a design quite like this one. I admit when I first tested out the stitch I was very skeptical. But after forcing myself to stick it out for about five or six rows, I was very pleased with the stitch pattern. The pattern produces a helix/zigzag-like design for the ribbing and is separated with yarn-overs which make up the lace portion. 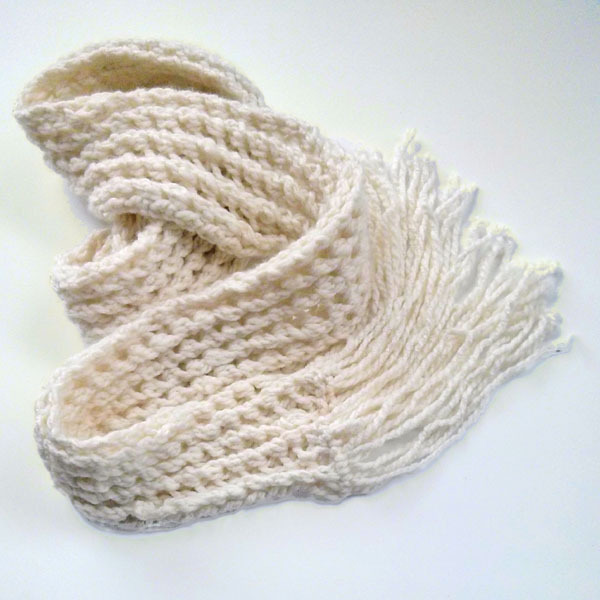 I used a bamboo/acrylic blend yarn which makes this scarf look extra fluffy and airy (or maybe it’s just the stitch pattern). In the end, I am very pleased with the result: a very attractive and stretchy scarf that takes almost no time at all to knit. Side note: I do recommend blocking the scarf for best results. My scarf did curl a bit near the cast-on and bind-off edges. 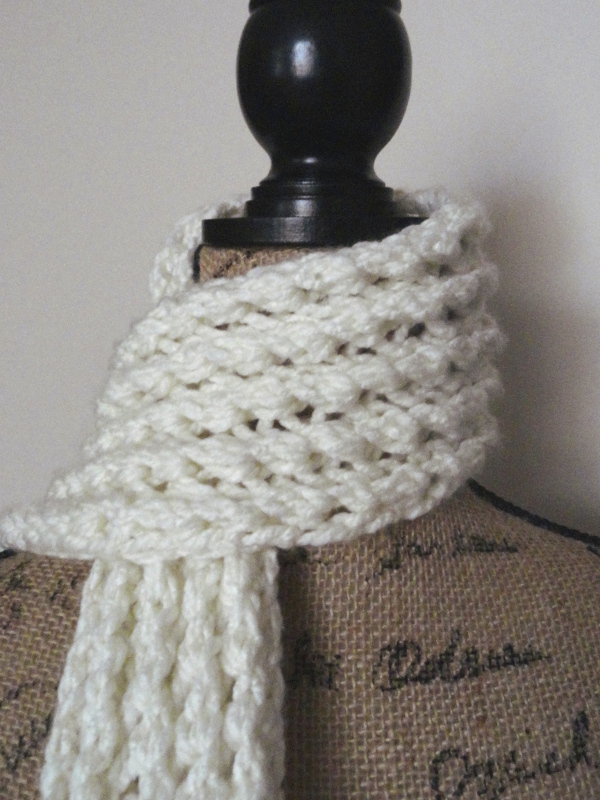 I added tassels to my Ribbed Lace Scarf. Measures approx. 63″ (160cm) long and 5″ (13cm) wide unstretched and without tassels. Row 1: K1, *yo, P3tog, yo, K1; rep from * to end of row. Row 2: P2tog, yo, K1, yo, *P3tog, yo, K1, yo; rep from * to last 2 sts, P2tog. 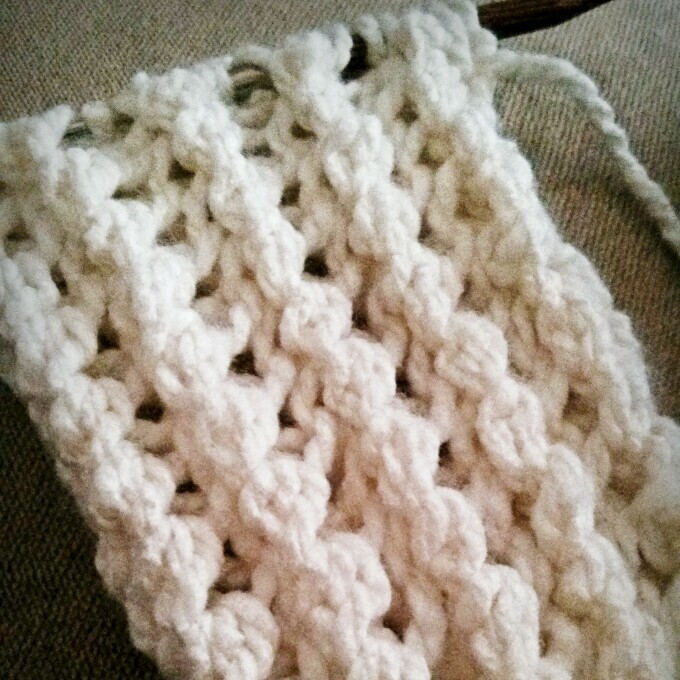 Repeat Rows 1-2 until desired length. Bind-off and weave in loose ends. Optional: add tassels. I love the scarf pictured, but I can’t figure out how you could make this scarf with only decreases and no increases; you’d have no stitches by row 4. I’m confused, and I’d really love to make this scarf as a present. The “yo”s (yarn overs) are increases. Everytime you do a yo it is one increase. In the repeat there are two increases and a p3tog is a decrease of two. So it equals out and you should have the same number of stitches you started off with. In the pattern above it says to CO 21 sts. how do you do yarn over? could someone explain it to me. I am so confused about that part of the pattern. Here is a video on how to knit the Bamboo Stitch: http://www.youtube.com/all_comments?v=AFb1FkEgoyM. There is a yarn over example shown in the video. Hi – sorry to trouble you, but I’m just a tad confused by the pattern. It says to cast on 21 stitches, but when I clicked on the link to see how it was actually done, it took me to Bamboo Stitch and stated for that pattern you should use an even number of stitches. Huge thanks, it really is a lovely scarf. The link provided in the comments is for another knitter who didn’t know how to knit a yo. As explained in that comment, the video is a tutorial for the Bamboo Stitch but the yo technique is shown and can be used as an example for this pattern. The video is a completely different stitch and should not be used for this pattern except for the yo part. Hi there, love the pattern! If I want to make scarf wider e.g. Double the width, would I double amount of stitches? Or would I still need an odd number of stitches? It would have to be a multiple of 4 sts + 1. Here is the stitch: http://purlavenue.com/2013/12/lacy-openwork-stitch.html. So if you want to double the width, it would be approximately 41 sts. Thank you, I’ll try it! As I am doing this pattern, it will start off as wide then go into very narrow. I am following the pattern but I can’t figue out what I am doing wrong. Please help me because I really want to get it right.